Here are the comments of our new Citizens Contract Oversight Committee about the new DOE procurement procedures and the contracts to be voted on tomorrow, Wed., Feb. 23 at the Panel for Educational Policy meeting. The meeting will be held at 6:00 P.M. at the High School of Fashion Industries on 225 West 24th Street; the agenda is here. As you can see, we had several reservations about the proposed procurement process and the contracts. If you'd like to join our Oversight Committee and provide your input, please email us at info@classsizematters.org ; thanks! Please send an email to the Mayor and the City Council Speaker Melissa Mark Viverito, urging them to expand the plan and create a Commission to speed the accuracy and efficiency of school planning and siting. 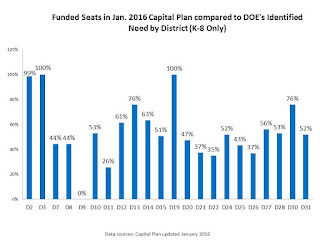 The DOE released its updated capital plan at the end of January. They have now identified an overall need of approximately 83,000 seats citywide – closer to our estimate of more than 100,000 seats and far more than their previous estimate of 49,000 in May. They also plan to build an additional 44,348 K12 seats compared to 32,629 previously, at an additional cost of nearly $1 billion. All of this is good news. The need for seats will grow even larger as will school overcrowding if the City Council approves the Mayor’s new rezoning proposals to allow for thousands of new housing units to be built throughout the city. We are urging the city to fund 83,000 seats – which would cost an additional $130 million according to the IBO. 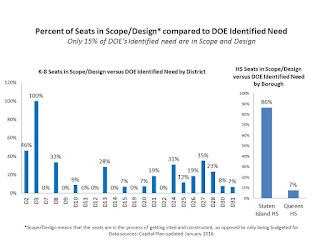 But even if these seats were fully funded, the DOE doesn’t appear to have the capacity to site and build schools efficiently enough. 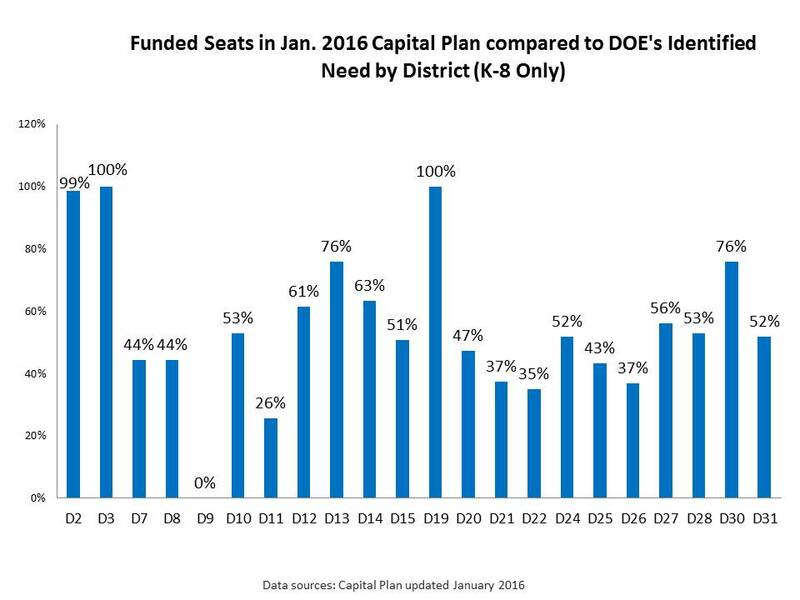 There are overcrowded communities for which funding has existed in the capital plan for over a decade without a single school being sited or built in their neighborhoods. That’s why we also need a Commission or Task Force to improve the whole process of school siting and planning – to make sure that schools are built along with housing and not decades afterward. Please send an email to the Mayor and the City Council Speaker Melissa Mark Viverito, urging them to expand the plan and create a Commission to speed the accuracy and efficiency of school planning and siting.More details concerning the changes in the capital plan are here; we also have charts showing how many seats are being funded in each school district compared to the actual need-- and how few seats are actually sited and in process of being actually designed. I was recently quoted in a Gotham Gazette where I said the crisis of school overcrowding is unacceptable in the richest city in the richest country in the world. Here are some recent newsclips about school overcrowding in the Bronx, Brooklyn, Staten Island, and Queens. Don’t you think it’s time to do something about this? Please send an email now! 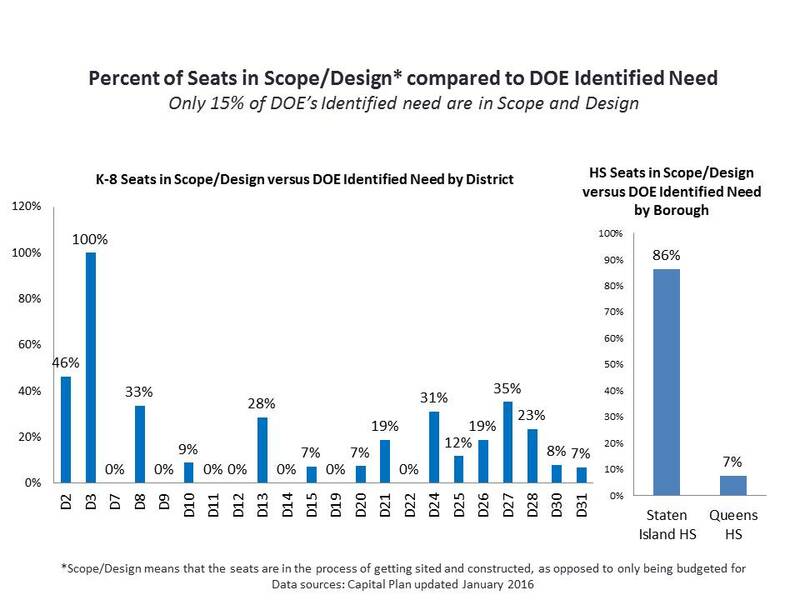 If you would like to see the overcrowding data for your district, and how many seats are planned for your district compared to the need, please let us know. We are speaking on the capital plan at CEC 30 on Feb. 22 and CEC 6 on Feb. 29. We can also come speak to your Community Education Council or Community Board on this issue. We also have a sample resolution for your CEC to consider. On Friday morning, the NY Times ran a story and posted the video above, a minute and 16 seconds of a teacher berating a first grade child at the Cobble Hill Success charter school in Brooklyn, ripping up her page of math work, and sending her to sit on the “calm down” chair. This video has gone viral, with an apparently greater impact than all the news articles, complaints, and lawsuits filed against Success charters in the past few years. There have been so many documented instances of students unfairly treated and pushed out of Success charter schools that it is difficult to know where to start. One of the first parents to tell her story of how her special needs son was pushed out of a Success charter school in Kindergarten within a few weeks of the beginning of the school year was Karen Sprowal, in a Michael Winerip column in the NY Times in July 2011 – nearly five years ago. We followed up with Karen’s own account on our blog here. Over the years, Juan Gonzalez of the Daily News has repeatedly chronicled the many documented instances of young children repeatedly suspended and ejected from Success Charters. For the first time, the NY Times started critically covering the school last spring, describing their high-pressured test prep tactics and severe disciplinary practices for the purpose of achieving high scores on the state exams. This fall, PBS ran a segment about the suspensions of young children at the Success Academy Charter Schools. You can see the segment here. Fatima Geidi spoke about the way the school had repeatedly suspended her first grade son for minor infractions, and refused to provide him with the special education services he was entitled to. While the reporter, John Merrow, attested to the fact that many other parents and teachers confirmed these system-wide practices, they told him they were afraid to appear on camera. Eva Moskowitz subsequently retaliated against Fatima and her son, by posting a falsified record of his disciplinary infractions, and sharing it with the media. Fatima filed a FERPA complaint to the federal government, pointing out how this violated his federal privacy rights. Months later, this falsified list of infractions was taken down from the Success website. Shortly after the PBS program ran, the NY Times published an October 29 article on the “Got to Go list,” composed by the principal at the Fort Greene Success charter school targeting certain students, and explaining that their parents had to be persuaded to take them out of the school. After that, a petition to the US Department of Education was posted online by Alliance for Quality Education and Color of Change, asking for a federal investigation and that the US Department of Education withhold any more federal funds from the school until the investigation was complete. The petition pointed out that the US Department of Education had given Success Academy charters more than $37 million dollars since 2010, and nearly three million dollars in 2015 alone. The petition received over 35,000 signatures. On the same date, January 20, a class action complaint to the Office of Civil Rights of the US Department of Education was brought by thirteen parents on behalf of their children with disabilities at eight different Success Academy charter schools in Manhattan, Brooklyn and Bronx. The complaint highlighted “systemic policies” that violated these students’ federal rights, including harassing and publicly shaming them, refusing to provide them with appropriate services, calling 911 to take them to the hospital when they allegedly misbehaved, and repeatedly suspending them without reporting these actions as suspensions, and without providing them with due process or alternative instruction as required by law. This class action complaint was joined by City Council Education Danny Dromm and Letitia James, the New York City Public Advocate. You can read the full complaint here. More recently, another lawsuit was filed by NY Lawyers for Public Interest on behalf of a parent of a former Kindergarten student with disabilities at Fort Greene Success Academy charter school, who was successfully pushed out of the school. Yet none of these documented news accounts or lawsuits has had the same impact on the public consciousness as this minute and sixteen second video. Is it the power of video in the digital age? The ability to see with your own eyes and viscerally experience the abusive treatment that these young children were forced to suffer through, week after week, year after year? Whatever the reason, let’s hope that this brings a wider public awareness not only about the practices of this particular chain of charters, but about all the “no excuses” charters that may produce better test scores, but at a very large human cost. As part of the reforms promised after the scandal with the $1.1 billion Computer Specialists contract erupted, DOE officials promised to post more complete information about proposed contracts (called the RA's) at least a month ahead of the Panel for Educational Policy vote, to allow for more public vetting. The DOE contract page now includes more information about these contracts as well as some brief information about contracts to be voted on in March and April. February 24, 2016 Agenda - a 4 page list of contracts to be voted on at the Feb. 24 PEP - items #1 through #20, including many multi-million dollar professional development contracts. February 24, 2016 Look Ahead for Future Meetings - a 5 page document with brief descriptions of contracts to be voted on March 23 and April 20, 2016. Because there will be many pages of information made available in advance, we are looking to crowd source comments from volunteers as part of a Citizen Oversight Committee -- to help screen and vet these contracts and glean information and concerns that could then be communicated to elected officials and members of the PEP. Yet as you will see, some of thee contracts to be voted on in two weeks, especially those related to preK vendors, still lack critical information. There is also a new document, highlighting changes in DOE procurement, which will be voted on at the Feb. 24 PEP as well posted here. We invite comments on this document as well. Earlier, I quoted one section of this document to the NYC Ed list which demanded that the Panel members should keep confidential any information they learn about the contracts and act solely in the DOE's interest; instead of urging them to act in the public interest; which are not always the same. Patrick, who is a former Manhattan member of the PEP who blew the whistle on many corrupt and wasteful contracts when he served on the panel. We are looking for volunteers who have experience with contracting, but also for ordinary parents and citizens who are concerned about the evident waste at DOE, who could spot outrageous contracts with no technical background at all, as I did with the Computer Specialist contract. Clearly the DOE games the system by awarding so many contracts retroactively, but here is a contract that is outrageous in terms of its cost that anyone reading this could spot. We're also looking for teachers who may have experience with some of the professional development contracts worth many millions of dollars that the DOE is awarding this month and in the months ahead, to Teacher's college, Pearson, Teaching Matters, and less well known (at least to me ) outfits like Literacy Support Systems.